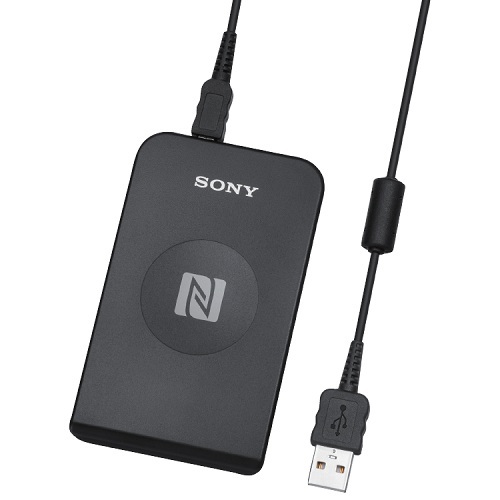 The RC-S380 product is the world's first reader certified by the NFC Forum Certification Program*. It is capable of communicating both with devices that conform to the NFC Forum specifications and with various contactless IC cards, including FeliCa™ and ISO/IEC 14443 Type A/Type B. * NFC Forum Certification Program: A program for the purpose of checking products' conformity to the NFC Forum specifications and ensuring compatibility among products. Conformance testing is performed on products submitted to authorized test laboratories with the validated test tools. Besides RC-S380, this package includes a card holder, a stand, a USB cable. And this product does not include a user's manual. Please find the web document here. This product is able to be shipped to USA, Canada, EU, Korea, Hong Kong, Taiwan, Thailand, Malaysia, Singapore, Philippines, Indonesia, India, Saudi Arabia and Brazil only. Available for communication with various devices conforming to the NFC Forum specifications. By connecting RC-S380 with Windows® 8 PC, users can pair up and exchange data easily with NFC-enabled smartphones. Read/Write capability with FeliCa card/FeliCa-compatible devices and ISO/IEC14443 Type A / Type B cards. RC-S380 supports NFC-Data Exchange Protocol (DEP) / NFC Simple NDEF Exchange Protocol (SNEP) / NFC Logical Link Control Protocol (LLCP) communication on both Windows® 7 and 8, which makes it possible to communicate with other P2P devices such as Android products. PC/SC interface for applications is provided to access FeliCa cards and ISO/IEC14443 Type A / Type B cards. Supports converting the vital data from healthcare products embedded with the NFC Dynamic Tag (FeliCa Plug) into ISO/IEEE 11073- Continua format data. As for the other regulation requirements, please contact us. *1 Communications distance depends on the peripheral environment. Under ideal conditions, this value is unaffected by electromagnetic waves or metallic substances. *2 Value when placing the card and device with the respective midpoints coinciding to remain on the reader. Note: Conforming to the RoHS Directive (a European environmental regulation), a halogen-type flame retardant is not used for the printed circuit board. Also, lead-free solder is used and the design is environmentally-friendly.